Eric Goedereis, associate professor of psychology in the College of Arts & Sciences, has received an Emerson Excellence in Teaching Award. Now in its 26th year, the awards pay tribute to area educators – from kindergarten teachers to college professors – for their achievements and dedication to the field of education. Goedereis was one of 102 educators honored at a ceremony in November, a ceremony that also honored five Webster University alumni. Goedereis, who has taught at Webster since 2009, says he approaches teaching the way a coach might approach his team, encouraging goal-setting and providing feedback and encouragement as students strive to meet those goals. 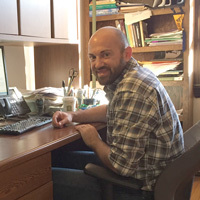 His recent focus, both within the classroom and beyond, has been facilitating and promoting collaborative research between students and faculty as a key part of the college experience. Emerson has honored outstanding St. Louis-area teachers with the awards since 1989. Read more about Goedereis' teaching and the award he received in Global Thinking, the blog for the College of Arts & Sciences.